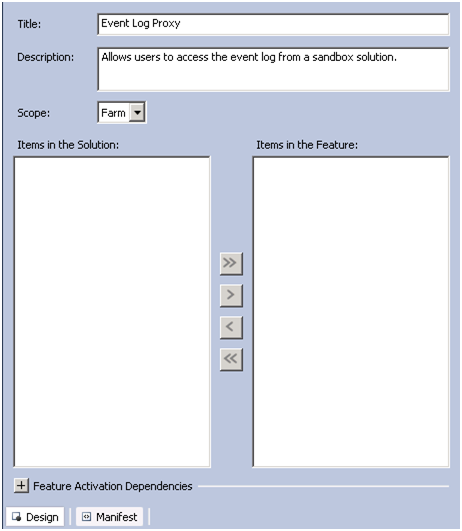 If you’re using the multi-tenant features of SharePoint, you will want tenants to use the sandbox. But, you will quickly find limitations. For example, developers cannot call a web service, read data from a external database, or write to the event log. One solution is for the farm administrator to deploy a full trust proxy that developers can use. Microsoft has a good description here, but there are no good examples. So I created one. Let’s create a full trust proxy that will allow developers to write to the event log. 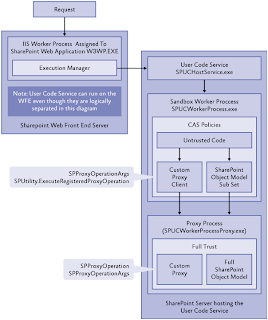 Sandbox code is executed in SPUWorkerProcess.exe (see diagram below). 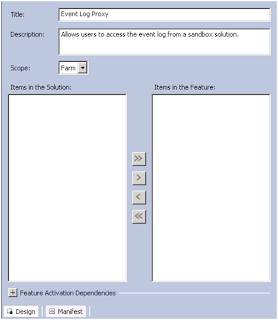 The Code Access Security (CAS) policy in this process does not allow developers to access the event log. 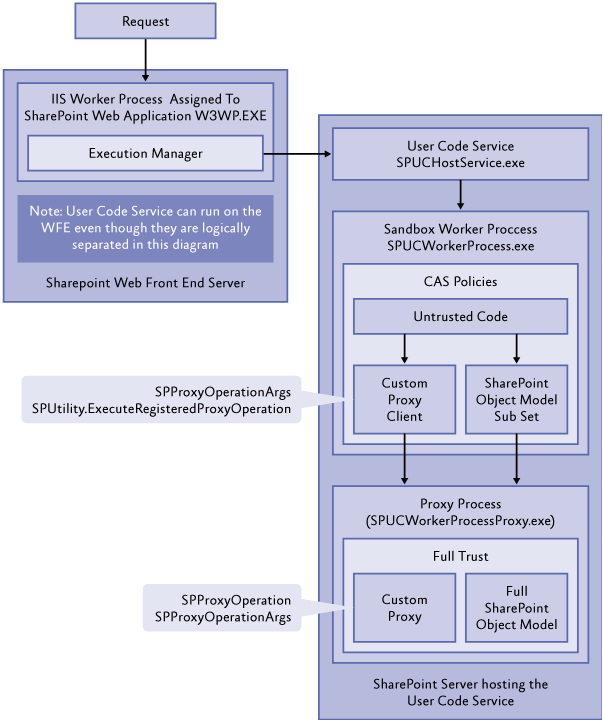 Therefore, we will write a full trust proxy that will marshal the call to SPUWorkerProcessProxy.exe which can access the event log. Start by creating a new “Empty SharePoint Project” that is deployed as a “farm solution”. Remember this is the solution that the farm administrator deploys. The tenant developer’s code will be deployed as a sandbox solution. Start by adding a new farm feature and fill out the title and description. Now, if you’re like me, the thought of writing seven lines of code to write one line to the log is crazy. Therefore, I added one more class to my solution with a helper method tenant developers can call. Finally, you can download the solution here. you will likely run into issues. If you need to check which proxies are registered, you can use the following PowerShell script. I recently presented an overview of multi-tenancy in one of my MBA classes. I discussed how multi-tenant applications allow cloud vendors to achieve economies of scale. 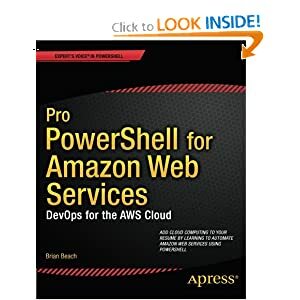 As an example, I showed the effect on total cost of ownership for the infrastructure if a cloud vendor moved from physical to virtual and then to a multi-tenant architecture. The multi-tenant architecture cuts cost by 80%. Imagine that you work at a midsize company that develops and hosts a SaaS (Software as a Service) solution. You have been growing recently and now have 100 customers. Each customer gets its own server that your company hosts in its datacenter. You are currently supporting 100 physical servers. Unfortunately, the average utilization is only about 10%. Over three years, the total cost of ownership is about $2.2M ($1M for hardware acquisition, $400K for power, and $800K for support). Now imagine that IT moves to virtualization. If we are only 10% utilized, it follows that we only need 10 physical servers (each hosting 10 virtual servers). Leaving some room for growth and sudden spikes in demand, we decide to be safe and buy 20 servers (each hosting 5 virtual servers). This cuts our acquisition costs by 30%, and our power costs 80%, but notice that our support costs have gone up by 20%. Why? We now have 20 additional servers to support (100 VMs and 20 physical). Now image that we rewrote our applications to allow us to host multiple clients on the same server (i.e. multi-tenant). Again we decide to be safe and buy 20 servers. But, note that we longer need the 100 virtual servers. Therefore, our acquisition costs drop dramatically. We just cut $500K in licensing costs. In addition, out support team is only supporting 20 servers saving another $750K. Multi-tenant applications have dramatic impact on total cost of ownership. This allows cloud vendors to achieve economies of scale. What does this mean for the CIO? In general the best option for the average IT department is virtualization. 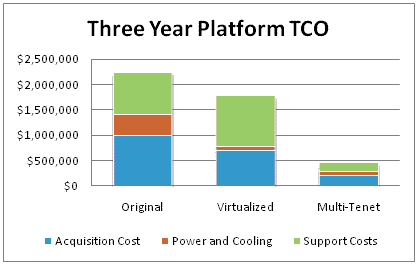 Therefore, a SaaS solution can often be cheaper than hosting a solution in your own datacenter. This is true even after the vendor applies his markup. BTW: Checkout the spreadsheet here. You can adjust my assumptions and tune the results.